1. Fill 2 highball glasses with crushed ice, pour 50ml of the Blackberry & Elderflower Pimm’s into each glass. 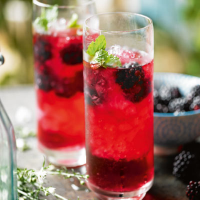 Top up with lemonade and serve garnished with blackberries and a sprig of mint.